It all starts like a fairytale: Located on one of the several lovely hills of the Veneto lies a picturesque town: Asolo. Just before you drive through the main city gate, there is a sophisticated building on the right. A building which you would never expect to be one of Veneto's best hotels. A small sign next to the inviting front door indicates the Villa Cipriani. The typical Venetian look clearly states that this Villa has a long history, having welcomed famous guests from all around the world. Once we entered the doors, the kind lady from the Concierge already expected us and showed us the way to the lounge, where we were having an Aperitivo. As we were sitting in Northern Italy, it was not only obligatory to order a glass of Prosecco, the bubbles also came with finest finger food prepared as an amuse for the upcoming dinner experience. I love the idea of Aperitivo serving small bites with your alcoholic drink during the early evening. After we finished our Aperitivo, which we finally decided to have on the terrace, the head waiter was welcoming us personally and accompanied us to the table: A wonderful table on the corner with views of (nearly) the entire region. Soon before the first course arrived, we ordered a bottle of Prosecco since we wanted to celebrate the fact that we are next to the famous Valdobbiadebe area - the origin of the Prosecco. While I had a wonderful hamd sliced Carpaccio with the famous Cipriani sauce, my colleague had an excellent tarte of eggplant. The accompanying bread was really good as were the butter and spread. For Secondo Piatto we both had the Ravioli with frehs truffles - a simply perfect dish which was also wonderfully presented. 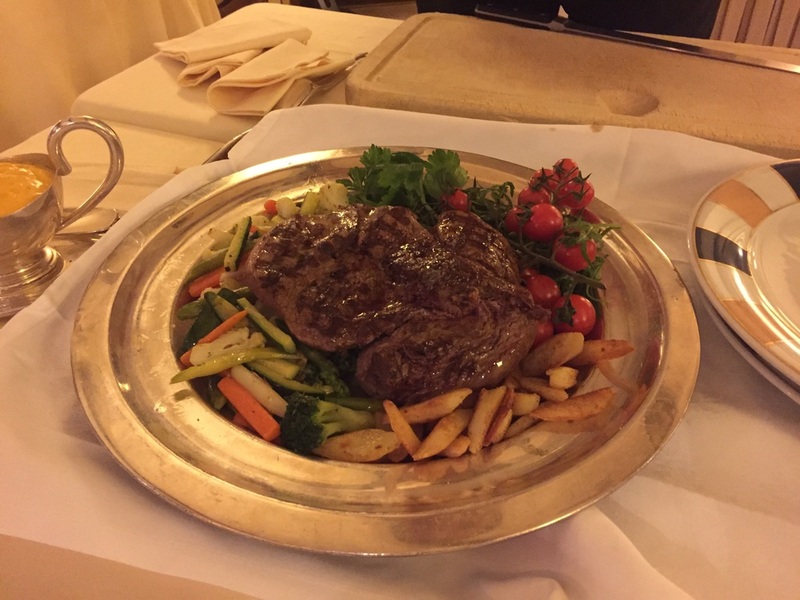 Our main course consisted of an outrageous "Chateaubriand" - a truly classical dish. Perfectly medium-rare cooked fillet which would have fitted for four, has been prepared on the side table in front of us. In general we found the service to be very friendly with an old-school-look (like you expect it from such a perfect setting), tough with a refreshing and attentive touch. The main course has been accompanied by potatoes, excellent vegetables and a wondeful Cabernet Sauvignon from the region. All in all the staff was very well informed and could answer all our questions. Due to the sumptuous main course, there was absolutely no space for dessert. However we did not skip an excellent Espresso and the staff was treating us with some small deliciacies. I mean who would deny some "Brutti e Buoni"? It would have been a shame if we would have sent them back ;). Finally, the only thing we could have changed was the fact that we did not stay at Villa Cipriani - their outdoor pool looks gorgeous and the private garden is a hidden paradise. 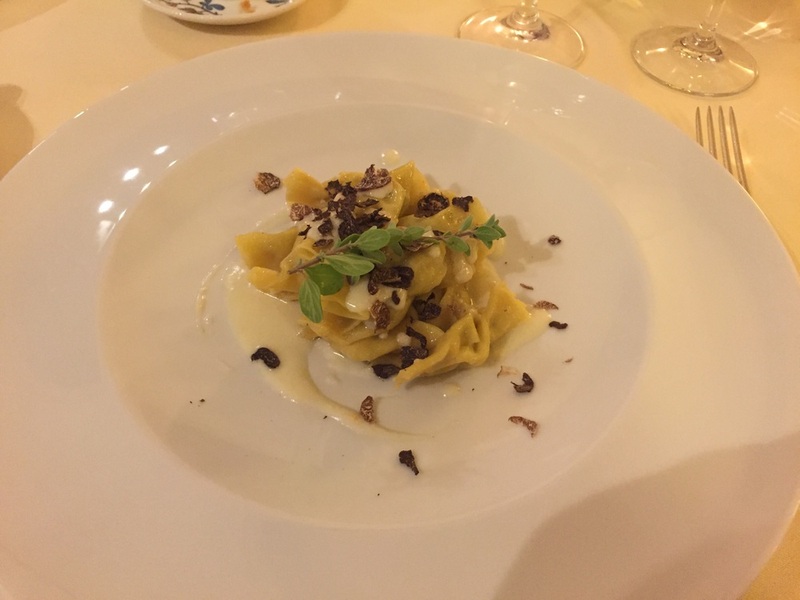 Our evening at the Restaurant of the Villa Cipriani was simply amazing and met our expectations on all aspects - that's excately what you should been looking for when in the area of Venice! Look no further and reserve your table there, you will be impressed! We were guests of the Villa Cipriani, however we truly enjoyed the dinner. All above written expresses our own opinion and has not been influenced. Are luxury hotels worth their money?